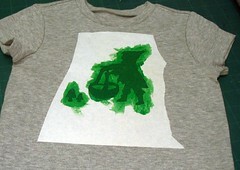 I traced a silhouette and then cut it out with an x-acto then ironed it on the shirt. Then, this is the key I think, I ironed on another piece of freezer paper on the inside behind the elf, so the grain of the fabric couldn't shift and the paint couldn't soak though the back. I used fabric paint (Jacquard) and sort of dabbed it on. I let dry over night, heat set it, and we are good to go. I know you can gocco this type of thing, but goccoing on fabric freaks me out. It's so quick, either it works or it doesn't and makes me crazy. 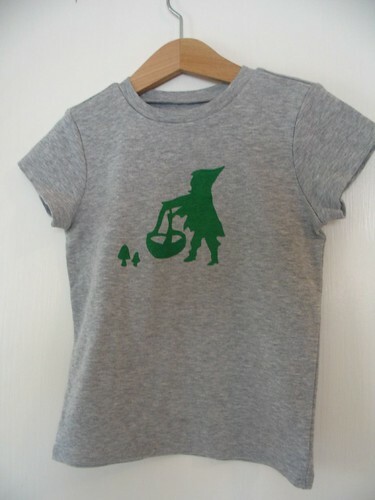 If I thought I were going to do a lot of shirts with the same design- gocco or a silk screen would be better, but for one or two shirts, I love this method. 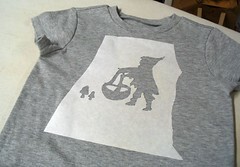 The stencil isn't reusable, so you would have to cut another, but it only took about 5 minutes. Now I need to stop myself from doing this to everything in the hamper. and here's my plug, mailorder #2 is on sale now over here. . . .